Philip V (November 17, 1293 – January 3, 1322), called the Tall (French: le Long), was King of France and Navarre (as Philip II) and Count of Champagne from 1316 until his death, and the second to last of the House of Capet. More interested than his father in internal matters, he did much to increase the stability of the realm and to improve its governance. He ruled with the embryonic Parliament, or estates-general, which was first convened by Philip IV in 1302. Philip V made use of the estates-general to confirm his claim to the throne, but also, to some extent, to rule collaboratively with his subjects. This aided the process by which the state ceased to be understood as the personal possession of the king, who could do whatever he wanted, and the development of the view of the king as ruling with the consent of the people. This was implicit when Philip requested recognition as King by the estates-general on February 2, 1317. Philip persecuted the Jews of France, but otherwise appears to have had the interests of his people at heart. His system of local militias improved security, and his efforts to standardize coinage, weights, and measures attempted to ensure fair trade by making it harder for merchants to cheat. Philip was born in Lyon, the second son of King Philip IV and Jeanne of Navarre. Philip was created Count of Poitou in 1311. 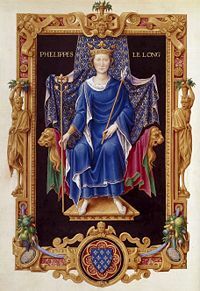 When Philip IV died in 1311, his oldest son, Louis succeeded him as Louis X. He died in 1316, leaving a daughter, Joan, as his only child although his wife, Clemence, was pregnant. The French Parliament, the estates-general, a somewhat informal gathering of barons, bishops, and scholars, declared Philip regent for eighteen years until the child reached maturity. This was effective whether the child proved to be a boy or a girl. In fact, Clemence gave birth to a son, but he only lived for a few days. On the child's premature death, Philip declared himself king, and was crowned on January 9, 1317. He was confirmed as king by the estates-general on February 2, which ruled that Joan could not succeed, as a female could not rule. Jeanne (1308-1349), Countess of Burgundy in her own right and consort of Eudes IV, Duke of Burgundy. The County and Duchy of Burgundy were united due to their marriage. Marguerite (1310-May 9, 1382). Consort of Louis I of Flanders. Isabelle (c. 1311-April, 1345). Consort to Guigues VIII de La Tour du Pin, Dauphin du Viennois. They also had a son, whose name was either Philip or Louis and who died in 1317. This meant that his younger brother, Charles, became his heir, succeeding as Charles IV. In 1320, Philip managed to expand his territory through war at the expense of Flanders. However, he was more interested in internal affairs than his father, whose main interests had been in war and in taxing the people to pay for his debts. Philip attempted to institute government reforms; for example, he set up militias to keep the peace. These consisted of local citizens under a captain-at-arms who reported to the king. He worked to standardize weights and measures. He made it more difficult for local officials to misuse their authority. He promulgated a series of regulations on the conduct of the staff of the royal household. He also restored the goods and dignity of many of his father's closest dignitaries and collaborators (including Enguerrand de Marigny), who had been banished under Louis X. He was one of the first kings who did not regard his power as absolute, unlike his father, and who therefore tried to rule with the aid of Parliament. He strengthened the estates-general, although its members resisted his efforts to standardize and centralize the coinage of the realm. In their view this represented a monopoly at the cost of their own income. Like his father, though, he extorted as much money as he could from the Jews of France. The year he died, Jews were allegedly expelled (Brown, 1991). A lover of poetry, Philip filled his court with literati. The Papal Court, which had moved to Avignon under his father, also attracted artists and intellectuals, including Petrarch and Simone Martini. Philip V died at Longchamp, Paris, and is interred in Saint Denis Basilica. Philip V died on January 3, 1322. Without a male heir, he was succeeded by his younger brother, Charles IV. Philip V left France a more unified, coherently organized, secure, and peaceful realm than it had been under his father. He did not share his father's desire for absolute authority and set in motion a process of ruling with the help of parliament. After and during the Hundred Years War, following his successor's death in 1328, when Edward III of England claimed the throne, the authority of parliaments increased on both side of the channel. Kings needed the support of the barons and of other feudal stakeholders if they were to raise the money or the troops they needed to prosecute war. The notion that the state was the personal possession of the ruler thus gave way to the notion that a ruler ruled with the consent of the people, and the people with the king constituted the state. Brown, Elizabeth A. R. 1991. "Philip V, Charles IV, and the Jews of France: The Alleged Expulsion of 1322." Speculum. 66, no. 2: 294-329. This page was last modified on 25 April 2015, at 22:29.